The HX Type filter contains a 1 micron carbon block, scale inhibitor and KDF media for reducing the bacteria and heavy metal content of your water. This carefully developed combination has proved to be effective in solving the problems associated with hard water - controlling the scale formation which blocks pipe work and damages equipment. This filters scale inhibitor makes it ideal for applications that involve elevated temperatures, typically hot drink vending machines and hot water boilers. The Carbon X head is no longer produced if you need a new head we can upgrade your system. Please call 01704 531556 for technical advice if needed. Excellent price, good quality filter. Ordering and delivery excellent. 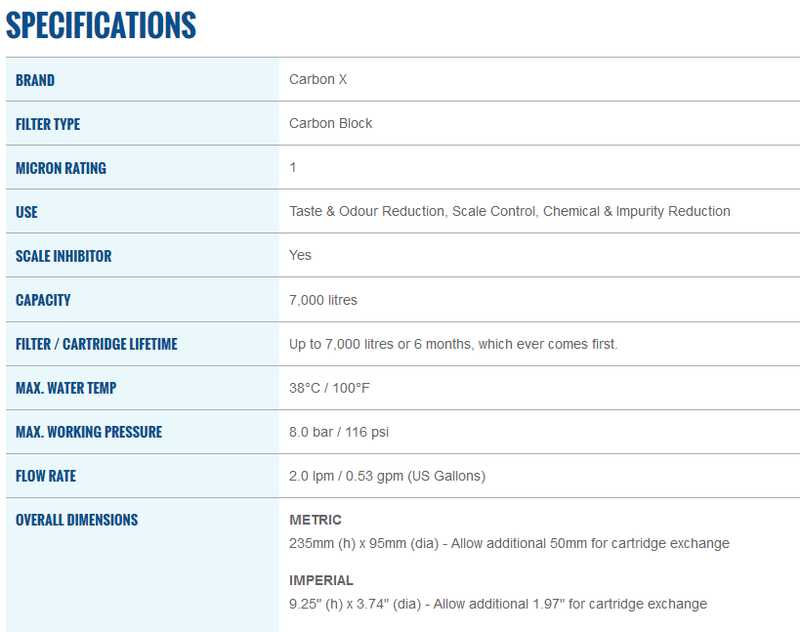 Click the button below to add the Carbon X - CHX7000Plus Replacement HX+ Filter (used for the Lincat CFC1) to your wish list.